Reciprocal Links. We used to have a links section at StampAuctionNetwork. Then we choose to only focus on auctions. In 2019, we are bringing back a Stamp Collecting Links resource. We will publish your link if you publish ours. If you want to participate, place our link as follows at your web site and send us the URL where it is located. When we see the link we will post your link. <a href="https://StampAuctionNetwork.com">StampAuctionNetwork</a> is the best web site to learn about and participate in Stamp Auctions in the US and around the World. Research market values by accessing $1.2 Billion in prices realized from 240 auction firms and much more. StampAuctionNetwork is the best web site to learn about and participate in Stamp Auctions in the US and around the World. Research market values by accessing $1.2 Billion in prices realized from 240 auction firms and much more. Save without Spending a lot with StampAuctionNetwork Extended Features. I had one of those phone calls today. You know the one where a bidder calls up to ask if his bids were executed correctly. Usually I just say, "bid what you think the lot is worth, and what you are willing to pay", as there is no better advice. But this morning I was working on a new feature in Extended features that consolidates selling history by NH, Mint, no gum, used and covers and provides metrics for bidding demand, so I thought I would use the new tool to see if it could have made a difference. It was the age old question of why all his bids sold at his top bid even when just prior to the close they were selling for much less than that. I pulled up the Extended Features Search by Catalog number and we worked through each lot explaining to him what he could have seen for himself. The first lot he bid on was a copy of RO100a. Extended features is especially helpful for items that are inexpensive but have low demand. There were three listings in 2018, all the same lot, with suggested bids of $38, $30 and $24. There was an average of Zero bids per lot. There was 1 match at the PF and none at the Siegel PowerSearch database. With this information, he could have confidently bid the opening of $12. Instead he bid $15, it was selling to him at the close for $12 and it was sold to him for $15. His next bid was on RS24P1. This was an almost identical situation. It had been offered 3 times in 2018. Each was the identical stamp, with suggested bids of $50, $40, and $32. The third offering was the lot he bid on. Using the new "Supply/Demand Metrics", I could see that the item had an average of less than 1 bid each time it was offered. There were no matches at either the PF or Siegel PowerSearch databases. Again, he could have bid the opening and won the lot for $16. Instead his bid of $24 was sold to him for $24. His last bid was for a copy of RS245a. This was a bit more interesting. There were 3 listings, but the first one was from a different seller, and sold in 2018 for $28. The 2nd copy went unsold. The 3rd copy, which was the same as the 2nd copy, which had been offered just 6 weeks earlier was the one he bid on. The suggested bid had been reduced to $40 from $50. "Supply/Demand Metrics" showed a bidding history of less than one bid per lot. Given that the lot went unsold just 6 weeks earlier, it would have been reasonable to just bid the opening of $20. My bidder bid $45 and it was sold to him for $40. StampAuctionNetwork Agent Bidding is Free if you win less than $1000 in a single sale! Well it is not a widely known fact. But after a sale, I send out the results, which is in the form of an invoice. But I only send a PayPal invoice if your total is $10 or more. So if you send me your $6, I will of course accept it, but I am not going to go to the trouble of setting up an invoice and tracking whether you paid it or not if your total is less than $10 -- I have too much to do. So that is just one more reason to sign up for Extended Features at $79.95 / year or less than $7 / month. It is a terrific bargain. Not to mention, that Agent Bidding is available with BASIC support, which is an option where you pay whatever you feel is fair. With BASIC, you get limited access (25 records returned) to all of the Extended searching features -- which by the way is all you need if you are smart enough to restrict your searches and sort them in a way that makes sense. FYI, the cheapest Software as a Service (Saas) models start out at $19.95/month. Extended features is a exceptional bargain at one third of that. Of course, $7 is still not cheap unless the value outweighs the cost significantly. And of course it does! June 20, 2018 - StampAuctionNetwork Agent Bidding Update. StampAuctionNetwork Agent Bidding was thoroughly test and performed exceptionally. We had 7 bidders participate in the test, They bid on 40 lots in the Siegel International Sale, they won 8 lots, won all the ties, bought lots totalling $14,500, and saved $1,650 at a cost of $145. SAN Agent fees are waived in June, 2018 to anyone who uses the service. You must join StampAuctionNetwork Basic or Extended features at some level (trial, BASIC, Extended, or PowerUser), but that can be as little as $9.95/year. Fees are 1% of the hammer price. We are please to announce that StampAuctionNetwork just crossed over $1.1 Billion in prices realized! (adjusted for currency). Yesterday we reposted 12 sales by Christoph Gartner, Corinphila Auctions and Behr, last week we added a number of recent David Feldman SA sales, and Shreves Sales 7-39, 151-157, and 161-162 (31,000 lots with PR's of 45 million). No other stamp auction site has this significant a database of prices realized. Get more info here. June 8, 2018 -- StampAuctionNetwork Agent Bidding! During our recent survey many StampAuctionNetwork users suggested StampAuctionNetwork act as an agent during live bidding, so as to not reveal their maximum bid. We have developed this feature and it is ready to use. If you leave book bids in an auction with Live Bidding at StampAuctionNetwork, you will find this very useful. To evaluate this feature, we will waive the 1% agent fee for any lots you win with StampAuctionNetwork Agent bidding in June. SAN Agent bidding is an Extended Features option, so you will need to support SAN at some capacity, a trial, a voluntary amount, or the full extended features subscription. You will be able to evaluate it in June with just the "trial" option. The auction firms will not see SAN Agent bids until the lot is opened. We will charge you 1% of the realized amount, with no caps or minimums if your SAN Agent bid is successul. Agent fees will be waived in June. We will send you an invoice after the close of the sale. Payment is due on acceptance of the lot from the auction house. May 14, 2018 -- StampAuctionNetwork closing in on $1 Billion in Prices Realized! StampAuctionNetwork links 5 Awesome Search Tools! Our latest feature at StampAuctionNetwork now gives you immediate access to 5 great search tools. After you do a Country and Catalog Search at StampAuctionNetwork, you can immediately link to the corresponding pages at The Philatelic Foundation's PF Search (2 tools - Certs and Population), Siegel Auction Galleries POWER SEARCH™, and the Professional Stamp Experts ("PSE") population reports. There really more than 5 resources, but we are counting our own search as 1, and only the searches that are a click away. Once you are at Siegel Auction Galleries or Professional Stamp Experts, they have a number of other valuable resources. The location of the links are show in the image to the right, highlighted in yellow. 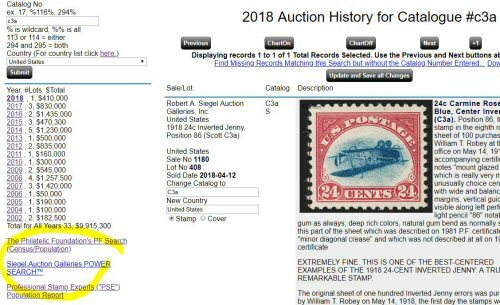 Cherrystone Philatelic Auctioneers brings StampAuctionNetwork just shy of $1 Billion in Prices Realized! Call for Stamp Champions to manage and standardize the StampAuctionNetwork database! Extended Features Update -- 90 days for $30 offer! StampAuctionNetwork's 30 days of Free Extended Services is coming to a close! Over the next 4 days, you can find out which stamps have the highest population and realizations from our database of almost $1 billion in auction realizations. But here are a couple items we want you to know. 90 days for $30 offer. Knowledge is power, and that knowledge translates into dollar savings for you. The more you know about what you are collecting, its availability, its history, the better you are positioned to save money. One early Extended Features user was able to pick up a stamp in better condition for $800 while he watched two other bidders fight it out for over $2000 for a poor copy. If you are serious, you probably have auctions catalogs in your reference library. As we can, we are going to eliminate your need to manually go through them. The value of this seems obvious, but it seems to be a hard sell, so we are going to make it hard to resist, sign up for 90 days for $30. Money Back Guarantee. For the month of April, we are offering a 100% money back, no questions asked policy to anyone that signs up for Extended Features. To get this option, just email me telling me what you collect and what you hope to get out of Extended Features, and I will do what I can to make that happen. If you are not satisfied, I will refund your money. We are taking requests.... Once the 30 days of Free Extended Features runs out, we are taking requests. Just email me the catalog number of an item you want total access to with the trial version and I will add it to the list. What can we do for you with Extended Features? Drop us a note. What do you want to see? Last week we posted 148 sales, 52,000 lots from Modern Stamps with total prices realized of $3 million. We selected just items with catalog numbers that should be included in the database. We will have another major announcement this week. StampAuctionNetwork is excited to announce this new level of service available to all collectors, auction firms and dealers that will provide each with the ability to understand the trends in stamp values like never before! StampAuctionNetwork is an amazing database dating back 17 years that has captured some of the most prestigious sales held over the last two decades. Here are a just a few interesting facts about the data that make it such a powerful resource for Philatelists. Although most of sales that we have been saving were major US Auction sales, there are still 150 million of prices realized for Great Britain, Germany, France and the rest of the world. You may be asking in this day of FREE everything, why should I pay for this? First, knowledge is power, is money saved. Access to this information will pay for itself. The problem here is not technology. We have written a number of important databases, Siegel's PowerSearch, the PF Search and Expertizing database, we even scanned all of the Siegel Auction Catalogs and brought them online for Robert A. Siegel. The challenge is getting standardized information from a myriad of data sources. You are paying for us to collect and provide a means to make sense of all the different ways auction firms categorize countries, catalogue numbers, conditions and symbols. The following is just the major sections of data you can search through at StampAuctionNetwork now. We are in discussions with at least a half dozen major contributors to the database. We plan to bring as much on line as possible, and create a database that will give you the best results. If you are a serious collector, you will spend more than our subscription just finding and buying old catalogs to search through manually. We have come to the point where StampAuctionNetwork now represents almost 100% of the worldwide stamp auction marketplace. This will matter to the future generations of collecting as they will expect this kind of data to be at their fingertips. StampAuctionNetwork is committing to save all auctions we post. If the auction firm posts prices realized, we will keep the data on line. This will encourage all of the auction firms to provide prices realized. We are going to keep saving all your bids for you. The basic version will give you access to your bids back to 2014 and moving forward. You will be able to use that information in ways you haven't even thought of yet. We are committing to standardizing the data so it can be searched easily. This means creating intelligence in our software to translate the myriad ways we get the info from the auction firms. It is going to encourage Auction firms to provide catalog numbers, condition and symbols on every lot where it makes a difference, so the trending information is even more helpful. You will be able to track and use StampAuctionNetwork to maintain much of your stamp inventory. You will be able to find out what you paid for an item 15 years ago. You have better information to assess the market and get bidding information. It was always a bad idea to "let the underbidder determine the market price", now you will have real information. You will be able to pull up historically, your bidding patterns for a particular stamp. We really don't know the potential impact for stamp collecting, but this can be a real game changer. It will have a dramatic impact. This is a strong move for Stamp Collecting. With this initiative, and our unique position of the first and oldest internet auction site, we have the historical resources to offer immediate benefits to the philatelic community and the ability to grow that throughout the years ahead. Follow this link, Login, and try it out FREE for 7 days!